My grandsons liked the bracklets. Very stylish and great looking for males. My grandsons wear the bracelets very often and get compliments. Keep every word of the Lord's Prayer close to you with this handsome leather bracelet. 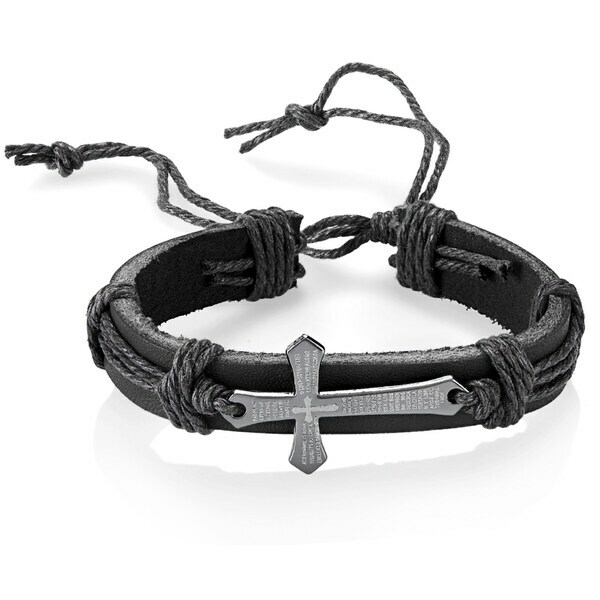 The jewelry item features a leather strap with a Spanish Lord's Prayer polished flared cross twined with strings onto the center of the bracelet. The Lord's Prayer cross accentuates a handsome leather strap to create a true religious and stylish accessory. The leather bracelet is soft and flexible, and contours well onto the shape of you wrist. This bracelet is 14mm wide by 6mm thick, weighs 10 grams, and secures with a pull string clasp. The pull string closure on this bracelet allows you to size the length from 8 inches up to 10 inches. Dimensions 8.0 In. X 0.6 In. X 0.3 In. I love the look of this bracelet. It is masculine and very cool. I purchased this as a present and they loved it. I would buy it again. Bought this for my husband. Looks great, he loves it. He gets many compliments. You can’t beat the price. Very stylish . Bought it in black also. I bought this as a gift and the person loved it. It is nice and sturdy. I would buy it again as a gift.. This product can be used for a child or an adult. not bad for the price.. it looks good even though it was not expensive at all..
Cheaply constructed, broke and hour after wearing it. 2nd time I've bought! Broke both time within a couple of days!! A great way to acknowledge my faith.